It’s Christmas. For a lot of us, it’s a time for joy, peace, happiness, and all the other fluffy things we think of this time of year. It’s Hallmark Christmas movies where it snows at just the right moment and the girl always ends up with the guy. That Christmas season was surrounded by hurt, loss, depression, and uneasiness about where my life was at and was going. 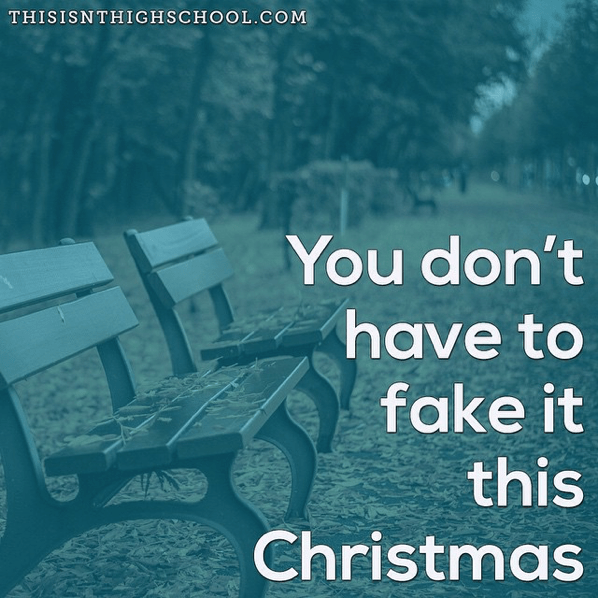 I don’t know where you are this year, but please know you don’t have to fake it this Christmas. You don’t have to put on the sweater or fake the smile any longer. If you’re hurting, you’re allowed to hurt. If you miss a loved one, you’re allowed to miss a loved one. If you’re scared, you’re allowed to be scared. The beauty of Christmas is that it happened in the midst of a messed up society in a time where everyone thought things couldn’t get any worse. It happened when people sat on the couch not smiling because they didn’t know where their life was at or where it was going. It happened when all hope was lost. The hope of the world came when we no longer had any hope left. Jesus – the God who took on flesh and experienced every single emotion we have and ever will have – came to be with us. We no longer have to wait for him. He has arrived and wants us to know it’s all going to be okay. There will be troubles, but he has already taken care of it. You may not be able to smile today on Christmas Eve, but a baby’s birth on Christmas Day is a reason to smile tomorrow. There is joy on it’s way. Hope is about to arrive.